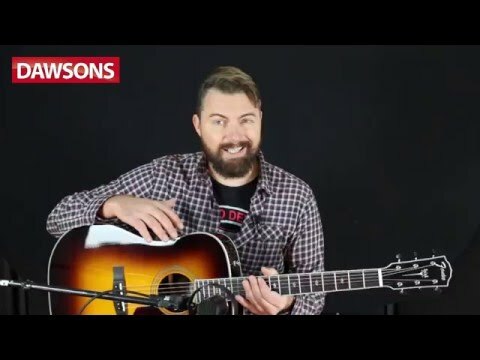 Fender have designed a new range of affordable, high quality acoustic guitars using years of experience and knowledge to do so. Straight from the new Fender Paramount range is the PM-1 Deluxe Dreadnought Acoustic Guitar. The luthiers at Fender are experts in what they do, and have come together to develop a set of dependable, affordable guitars which are complete with key features and premium tonewoods, with superb onboard electronics to boot. Fender have carefully selected exceptional tonewoods to build the PM-1 Deluxe Dreadnought to a high specification. A solid spruce top combined with a dreadnought body profile presents you with a wealth of flexibility in a dynamic tonal range which enhances your sound whether you prefer fingerpicking or strumming. The back and sides of the PM-1 Deluxe are made up of rosewood which expands your overall tone and can always be relied on for a versatile, acoustic timbre. Firmly fitted to the body is a mahogany neck with a smooth, comfortable playing feel. Married to the neck is an ebony fingerboard, with 20 frets at your service. Fender have chosen mop / abalone concert tone inlays, just like its counterparts from the 60s, and these decorate the frets to guide you from one to the next. The PM-1 Deluxe Dreadnought is fitted with a first-rate Fender Fishman Paramount preamp to extend your tone further. It includes a bass and treble EQ, and a built-in tuner which conveniently ensures tuning accuracy is maintained at all times. The preamp works quickly too, so as not to keep you waiting when you need to shape your tone, perfect for a live musician during a performance. A handy Phase switch also helps reduce any onstage feedback you may sometimes otherwise encounter. It’s doubtless that the onboard preamp wonderfully translates your overall acoustic tone through your desired amplifier. An ebony bridge is fitted to the solid spruce top and keeps a strong connection between the strings and the body. The PM-1 has a black headcap, and the headstock is fitted with open back nickel tuners with black buttons to uphold tuning integrity. The one-ply tortoiseshell pickguard completes a classic look and complements the finish of the guitar with style. Fender aim to ensure that once you own a guitar from the Paramount Deluxe series, it will be kept in pristine condition as the years go by. So, to help you properly look after this new axe, Fender include a hardshell case and a humidifier to protect your guitar against dirt and damage over time; two very vital accessories that help look after the PM-1 Deluxe. The Fender PM-1 Deluxe is a stunning, dreadnought acoustic guitar with plenty of top quality features and a truly individual appearance, but it also comes at an economical price which musicians can take great advantage of.